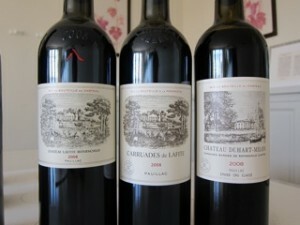 The top Chateaux in Bordeaux bottled their 2008 reds last summer, from May onwards. Since the autumn I’ve popped into all the Grands Crus Classés of the Left Bank (i.e. those in the 1855 classification) to taste them. Given that you can only taste the First Growths and others in situ, it seems the fairest way to assess all the wines on a level playing field, even if it’s time consuming. It also gave me a chance to taste the increasingly relevant second wines, and a few other wines that are owned by the Crus Classés (such as Pibran being in the same ownership as Pichon Baron). I also tasted the St-Emilion Premiers Grands Crus Classés (excluding Cheval Blanc, Ausone, Belair Monange and Magdelaine) in a single sitting. Although I’ve tasted plenty of Pomerols, these tastings are incomplete so I’ve left them out (Le Pin and Clinet are very good, though…). Likewise Pessac-Léognan and other wines from St-Emilion. Robert Parker is about to release his scores on 2008 from the bottle, in tandem with his initial 2010 scores from barrel. Here are my scores for the 2008 in bottle, alongside Parker’s original scores from barrel. Many of these wines are substantially less expensive than their 2009 and 2010 counterparts, so there are some deals to be had outside the First Growths. Further reports to follow.